The natural language processing capabilities of the Pega 7 Platform make it possible for you to classify content that is posted on social media (in the form of tweets, posts, comments, messages, and so on) into various categories to make that content easy to sort and manage. One of the many practical applications for text classification is customer support. By classifying customer queries or comments into various categories, the relevant information can be accessed more quickly, which increases the speed of customer support response times. You also can combine classification analysis with sentiment analysis (for example, in product reviews) to examine which product features are commented about the most often and whether the comments are negative, positive, or neutral. To use a custom taxonomy in your application, define the categories that you want to classify the content into, and then add those categories to a CSV file. Upload that file to your application as part of taxonomy decision data rules. Create decision data rules that can contain taxonomies in the Data-NLP-Taxonomy class. You can also click Save as in an existing taxonomy decision data rule to create a new one. 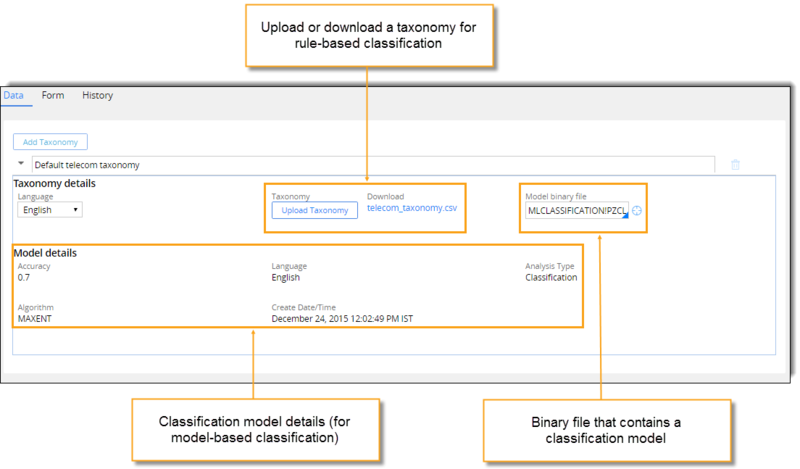 The taxonomies for rule-based text classification are stored in taxonomy decision data rules in CSV files. You can upload or download a taxonomy file to modify it (for example, to add or remove categories). To upload your custom taxonomy into the Pega 7 Platform, the .csv file must contain the following columns: Primary, Second, Should words, Must words, And words, Not words, Child match, and Node type. To extend your category definition with additional levels of subcategories, you can add columns that are named Third and Fourth. The following simplified taxonomy examples provide you with a basic understanding of how taxonomy construction works in the Pega 7 Platform. To view a full-fledged taxonomy with clearly defined categories, download the Telecom taxonomy. The double quotation marks (" ") and hyphen (-) characters are not supported when creating a taxonomy in Pega 7.2.2 through Pega 7.4. This column contains the top-level category. If you want to classify text content according to different types of products that you offer, the top-level category can be the product type, for example, Laptop, Phone, TV set, and so on. This column contains a secondary category that can be derived from the top-level category. Defining this category is optional; the Second column can be empty. Secondary categories can make text classification more granular. For example, you can extend the Laptop category and add secondary categories to it, such as Touchbar, Display, Audio, and so on. In the preceding example, any piece of content must contain the word "support," in addition to any of the Should words, to be included in the Primary column. If defined for the category, all Must words must be in the text. At least one of the Should words must be in the text. At least one And word must be in the text. The agent in the office offered lots of support. The text analyzer assigns this content to the In-store support category, because the content contains the Must word (support), a Should word (agent), and an And word (office). I was offered some support during the call. The text analyzed does not assign the content to any category, because the content does not include a Should word that could be associated with the And word (call). The staff did not support me at all! The text analyzer does not assign the content to any category, because the content does not include an And word that could modify the Should word to determine the category assignment of the sentence. Any combination of Should words and And words results in a category match. No specific sequence or order of appearance of Should words and And words is required for a category match. When you are dealing with words that have multiple meanings and you want to analyze the content that pertains only to a specific meaning of a word. For example, you analyze tweets about Apple products (for example, I just bought a brand new Apple laptop and it's great! ), but you want to exclude the tweets that refer to the word apple as a fruit (for example, Working on my new laptop and eating a delicious apple I bought today!). When you want to increase the accuracy with which the text analyzer assigns categories by specifying words that the text must not contain to be assigned to the corresponding category (in other words, you configure the text analyzer to not assign a category if the text contains specific words). In the following example, the words in the Not words column ensure that content such as The agent in the store didn't give me much support! is not assigned to the similar but incorrect Phone support category. Based on the taxonomy construction in the preceding example, the sentence I just learned the hard way that the voice response system in uPlusTelco is a nightmare will not be assigned to any category by the text analyzer. Although the sentence meets all the requirements for the Phone Support > Automated system category, the sentence does not contain the Must word (call) that the content is required to contain to be assigned to the parent category. If the Child match parameter is set to TRUE, the text analyzer rule first evaluates whether the content matches the parent category, and then matches the content to any secondary category, if specified. If the Child match parameter is set to FALSE, the same sentence is assigned to the Phone Support > Automated system category because the text analyzer skips the condition to match the parent category first. The values in this column indicate whether a row is a category or not. For all rows that contain categories in your taxonomy, the Node type column must have the value CATEGORY in it. Refer to the following guidelines to create a well-developed and efficient taxonomy that can help you to consistently and accurately classify the content that you extract from social media content. A taxonomy must include all possible categories that pertain to the subject of interest to make sure that all the content that you track with your social media data set is categorized correctly. For example, a well-constructed taxonomy for text analysis of reviews of one of your products (for example, a laptop) must contain categories for all key features of that product (for example, processor, display, memory, hard drive, peripherals, and so on). Perform multiple tests to discover whether the text analyzer that references your taxonomy classifies documents (tweets, posts, comments, and so on) as expected. Testing your taxonomy on a large number of samples can help you detect new categories to define or fine-tune the taxonomy to minimize tracking of unexpected content (for example, by adding or removing Should words, Must words, or And words). Continue testing until you are satisfied with the accuracy of your taxonomy. Taxonomies require regular maintenance to remain relevant and up-to-date. Incorporate new content into the existing categories and create new categories (for example, for new products, equipment, functionality, and so on) on a regular basis to ensure that your taxonomy provides the results that you expect.